madhya pradesh (mp) is one of the few states in India where development, or the lack of it, can have a direct bearing on the outcome of the elections. The ensuing assembly polls in the state are also being fought largely on this plank. On the one hand, chief minister (cm) Digvijay Singh -- who belongs to the Congress and has been at the helm for 10 years -- is claiming that investment in various social sectors has spurred the state's growth. On the other, the Bharatiya Janata Party (bjp) is alleging that several crucial areas have been neglected and there is corruption in the administrative machinery. Among the core issues are empowerment of panchayati raj institutions and schemes for the welfare of backward classes as well as Dalits. In addition to these, the acute shortage of power and poor condition of roads have caused widespread discontent in the state. decentralisation: Singh considers the handing over of power to village bodies one of his government's biggest achievements (see box: Reaching out). But Kailash Vijay Varghi, mayor of Indore and bjp's spokesperson in the state, contends: "While they have decided to hold sarpanchs and panchayats accountable for their actions, neither financial nor administrative powers have been given." M N Buch, a former bureaucrat of the state and chairperson of the National Centre for Human Settlements and Environment, a non-governmental organisation based in Bhopal, is even more scathing in his criticism of the mp model of decentralisation. "The transfer of power to panchayats was by way of delegation and not genuine devolution," he asserts. "When the sarpanchs of zila panchayats began to exercise their limited powers, the cm constituted the district planning committees (dpc) mandated by the 73rd amendment of the Constitution. A minister was asked to head each of these panels and the collector was made member secretary. The latter actually acquired more powers than the elected zila panchayat," points out Buch. Chottulal Sondhiya, sarpanch of Pipalve panchayat in Rajgarh district, says: "The village body has rights only on paper." Predictably, officials extol the positive aspects of the process. "Today, panchayati raj institutions are virtually in charge of matters like revenue collection, education, construction work, beneficiary selection and project supervision," states Rajgarh collector Neeraj Mandloi, adding: "It is compulsory for panchayats to handle all construction activity costing under Rs 5 lakh in government schemes." Subhash Yadav, deputy chief minister of mp, is also effusive: "For the first time, power has gone into the hands of villagers." dalit agenda: Jagdish Mogia of Khuri village in Rajgarh is grateful to the incumbent government. For the first time in centuries, his family owns land. Mogia belongs to the scheduled caste (sc) category. He has reaped a rich harvest, courtesy of the Bhopal declaration which was unveiled by Singh in January 2002. Under this, the cm had announced a slew of measures that were specifically aimed at Dalits. Earlier, the state decided to distribute the charnoi (grazing) tracts to landless Dalits. By the end of December 2002, more than 2.8 lakh hectares had been handed over to 3,44,329 sc and Scheduled Tribe (st) families. 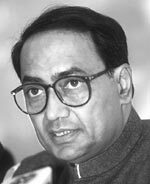 The Digvijay Singh government was expected to make significant electoral gains from these moves since the sc-st segment comprises about 36 per cent of Madhya Pradesh's electorate. But the drive has run into unforeseen difficulties. "The distribution of charnoi land has created a rift between the upper classes and Dalits. This is because the government has forcibly divested the former of their tracts to give them away to the latter," alleges Varghi. Yadav admits that "a few villages" in the state might have been affected, but stresses that it would not snowball into a controversy. Mogia is hopeful: "The sarpanch has promised that there will be no problem this year." other key factors: The state's electricity crisis is also likely to influence voter opinion. "The Digvijay Singh government has added a big fat zero in the power sector during the past decade," charges Buch. Varghi, too, lambasts the state authorities: "About 10 years back, the state had surplus electricity. But this government has destroyed everything." Singh has, however, been reported as saying: "Few people realise that the power shortage in our state is also because of Chhattisgarh being carved out of it. Our effort is to meet the challenge instead of indulging in gimmicks." What might make the electricity issue more significant is the fact that polling will coincide with the sowing season when farmers require more power. For his part, Singh has decided to divert about Rs 50 crore per month from various departments to purchase additional power. One of the most successful initiatives of the mp government is micro watershed development. "The state has pioneered the concept, which involves identifying a micro watershed, drawing up a suitable plan for it and bringing it under inexpensive treatment. This enhances vegetation cover, provides storage, prevents soil erosion and assists in sub-surface and groundwater recharge," elaborates Buch. Ironically, the programme may not have the desired impact because the good monsoon has almost rendered the water issue redundant for now. That the Congress is desperate is evident from the various populist measures the state government is resorting to. One such step, taken by the state cabinet on September 24 this year, pertains to the waiver of electricity dues for agriculture pumps of up to 5 horsepower for the period from January 1, 2001, to December 31, 2003. A total of 9.75 lakh farmers and 18 lakh single-point consumers would stand to gain from this decision. The move will cost the state exchequer about Rs 800 crore. "The issue of electricity was on the bjp's agenda. By writing off the power bills, we have scored a point over it," says Yadav. When asked why this was done, he reasons: "Our farmers have been continuously affected by droughts and their financial condition is not good. So a relief package has been provided to them."